They provide accurate positioning and alignment of a motor shaft and the shaft of a driven machine. 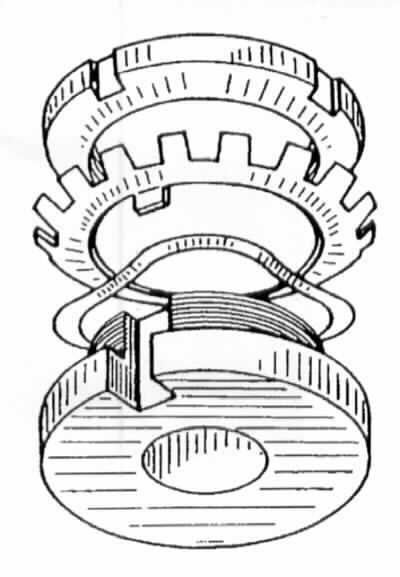 Height can be adjusted by means of the Dial-Shim. The rotation of one nut groove past one dial tab adjusts the height of the pad by a defined amount. When the proper alignment is obtained the dial tab that lines up with a groove in the nut is bent into the groove and positively locks the height in place. Dial-Shims eliminate the time consuming fitting and grinding of shims or the use of multiple shims. The pad is contained by the mounting screw and becomes an integral part of the mounting, nothing can vibrate loose or fall out. Re-alignment after foundation settlement or movement during shipment is made easy with Dial-Shims.